SKU: W-04. Category: Casual. Tag: Protectival. Based on more than two decades of research and clinical experience, Protectival™, (Clinical Trial name: LCS101) is LifeBiotic®s’ Dietary Supplement product, which has shown benefit for oncology patients. 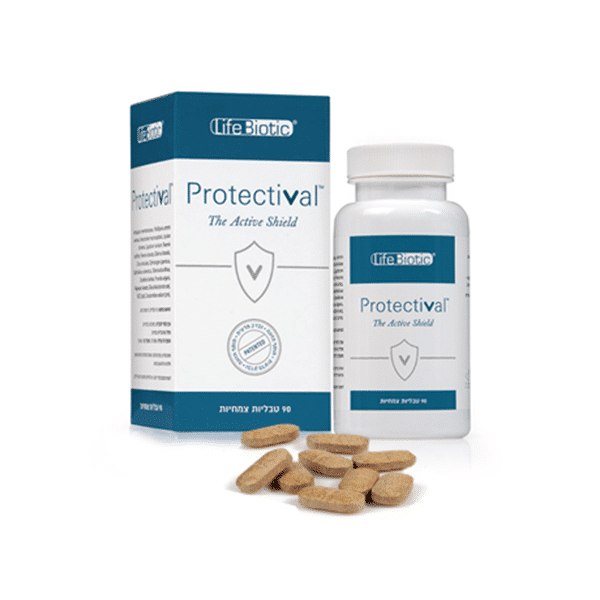 Protectival™ comes in a 90 tablet bottle and is manufactured by a rigorous production protocol from highly concentrated bio-active botanicals, known for their medicinal qualities. – Reducing side effects, protecting the body from toxins. In addition to the wide body of knowledge regarding its individual ingredients, Protectival™ is designed to synergize its constituent herbs, making the combined effect greater than that of its individual components. It was subjected to rigorous testing, including a randomized, controlled, double blind clinical test in breast cancer patients receiving chemotherapy in an oncology department, at the Sourasky medical center in Tel-Aviv, Israel. The study has demonstrated in a statistically significant and clinically meaningful way that Protectival™ is safe and effective, and its results have been published in one of the most prestigious peer reviewed oncology journals(1). At Refuot integrative medical centre, breast cancer patients undergoing chemotherapy were assessed prospectively, showing great improvement in quality-of-life (QOL) when compared with expected outcome of QOL during chemotherapy. The following categories were evaluated: fatigue; weakness; pain; nausea; vomiting. 80% none to mild vomiting. 85% reported that they felt that Protectival helped reduce their symptoms. No toxic effects were attributed by patients to the treatment (2). The clinical trials and resulting publication, in addition to over 200 preclinical trials, and the rigorous manufacturing and quality assurance process, were designed to ensure the safety and effectiveness of Protectival™, and differentiate it from other supplements and nutraceuticals in the market. Please write us info@mineralgarden.org if you want to order more than 1 can of Protectival nutritional supplements.